Niles Excavating has been in operation since 1986. The company was founded by Donald "Pete" Niles of Hinckley, Illinois. 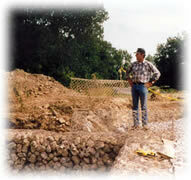 Pete has been involved in excavating and construction for residential, farming and commercial projects since 1958. As the owner, Pete is responsible for day to day operations. His employees are a team of experienced and dedicated workers. Niles Excavating, Inc. is fully licensed and insured. Copyright © 2013 : Niles Excavating, Inc. | All Rights Reserved on All Media.